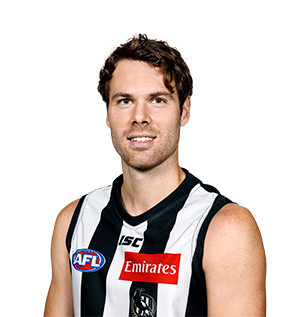 Collingwood defender Matthew Scharenberg will miss the remainder of the 2018 season, with scans confirming that he ruptured the anterior cruciate ligament in his left knee in the third term of the match against Richmond at the MCG last Saturday. After a slow start to the pre-season, precocious youngster Matthew Scharenberg has put together the most consistent block of football in his injury-hit career. Captain Scott Pendlebury has seen a noticeable rise in the confidence of Matthew Scharenberg, as the defender spends consistent time in Collingwood's starting 22. Once described by Mark Williams as the best schoolboy talent he had seen since Wayne Carey, the South Australian is extremely composed in his disposal and shows great temperament in heavy traffic. A 190cm key position player who is equally comfortable forward or back, Scharenberg collected back-to-back All Australian selections at a junior level in 2012 and 2013. His ability to read the play and strong hands makes him a force in the air while his poise in heavy traffic has stood out in the formative years of his career. His progress has been stalled repeatedly by injuries to his feet and knee, as well as multiple knee reconstructions. Finally fit at the beginning of 2017, Scharenberg managed 10 senior games in the second half of the year. His touch and influence improved as the campaign wore, boding well for what he is capable of in 2018 and beyond. At long last, Scharenberg was able to enjoy an injury-free season. The four that preceded it were marred by ailments, from feet to knees, and threatened to completely derail his career. Fortunately, the football Gods finally smiled on the South Australian, granting him a sustained run at senior football for the first time since he was drafted at the end of 2013. Sustained form in the VFL (highlighted by a 41-disposal performance against Box Hill) saw Scharenberg recalled to the seniors to face Brisbane in round 10. He occasionally dipped out of the side in the months that followed, but by season’s end had well entrenched himself in Collingwood’s best 22. The stretch of matches between rounds 19 and 21 was a particular highlight, averaging 25 disposals and 10 marks. Contracted for 2018, Collingwood supporters will be looking for further improvement as Scharenberg continues to regain confidence and strength in the years to come. Unfortunately for the promising young defender, the year ended before it even begun. Scharenberg was reportedly flying in pre-season training, before an innocuous injury at training delivered the worst news possible. In late November the South Australian had a full knee reconstruction, his second in three years. 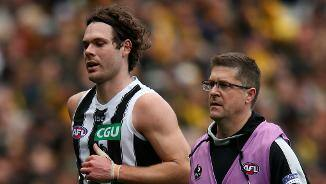 It rendered Scharenberg to the sidelines for the entirety of the 2016 season, with training loads confined to an intensive rehab program. Scharenberg’s progress reached a point late in the season where he was close to full-strength, however the club elected to gear his return to senior football to the upcoming 2017 campaign. 2015 could have easily been a ‘progress’ year for Scharenberg. One that saw him return from the most serious of knee injuries, play a few VFL games and ultimately spend time developing his skillset ahead of a potential debut in later years. Instead, it was the year the South Australian made it. As he ran onto the MCG in Collingwood’s round 18 clash against Melbourne, it was impossible to disregard the short but troubled journey Scharenberg took in his first two years at the Holden Centre. His 2015 campaign was effectively ruined before it even started after the 19-year-old tore his ACL against Bendigo in the VFL last year. However a strong workrate and desire to recover saw Scharenberg progress from rehab to joining the main group at training, before finally making his return to competitive action with the VFL Magpies in May. 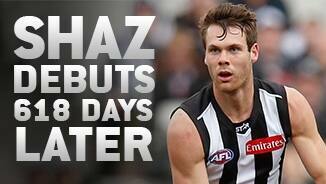 He excelled in defence at a VFL level and after 11 games under Dale Tapping worked his way into the Magpies AFL side. At the senior level he played four games, including one as the sub, and averaged 15 disposals and 4.5 marks before the conclusion of the season. While it was just a glimpse of what Scharenberg can offer, news of his re-signing to the club means that Collingwood supporters can expect to see a lot more in 2016 and beyond. He started the year under the surgeon’s knife and ended it in the rehabilitation group, but for a brief moment in between, Collingwood managed to see glimpses of what Matthew Scharenberg is capable of. The 19-year-old underwent surgery to have the sesamoid bones removed from his left and right feet in February, and, as a result, the club always took a long-term view to his progress. When he made it onto the field for five VFL outings, he hinted at his ability to read the play across half back, averaging 9.8 disposals, winning 16 and recording three tackles in his final full game against Geelong at Simonds Stadium. Sadly, he added an exclamation mark to Collingwood’s star-crossed season when his knee gave way during the second quarter of the VFL team’s win over Bendigo in the final round of the home and away season. Less than twenty-four hours later, Scharenberg would be joined by Brent Macaffer in hospital ward, meaning an unprecedented two players went down with torn anterior cruciate ligaments in the space of the one weekend. “He’s a robust kid who has already demonstrated his resilience with us to get back and play this year,” then-Director of Football Rodney Eade told collingwoodfc.com.au. Once described by Mark Williams as the best schoolboy talent he had seen since Wayne Carey, the South Australian is extremely composed in his disposal and shows great temperament in heavy traffic. 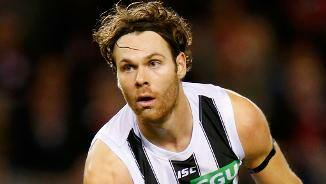 Scharenberg is a 190cm key position player who is equally comfortable forward or back. Had an outstanding NAB AFL Under-18 Championships which saw him collect back-to-back All Australian selections in 2012-13. Scharenberg came runner-up in the Larke Medal for the best player in Division One and his ability to read the play and strong hands make him an unstoppable force in the air. AFL Debut: Collingwood v Melbourne, Round 18 2015 at MCG. Collingwood VFL Debut: Frankston v Collingwood, Round 16 2014 at Frankston Park.